Multiple G2 Millionaire by Unbridled's Song Arguably the most versatile son of UNBRIDLED’S SONG: Named a TDN Rising Star after winning his 2yo debut over 4 1/2 furlongs in the Spring at Keeneland. At 3: Won $750,000 Louisiana Derby (G2) over G1 winners Drosselmeyer, Discreetly Mine, Ron the Greek. At 4: Won $500,000 New Orleans H. (G2) at 1 1/8 miles, defeating G1 winner Giant Oak; Runner-up in the Clark (G1) to Horse of the Year candidate Wise Dan. Runner-up in Stephen Foster (G1) by a head. At 5: Runner-up in the Donn H. (G1), losing by a nose on the wire; Also runner-up in the New Orleans H. (G2). Out of the Hold Your Peace mare La Paz, producer of 3 Graded stakes winners. Retires sound with earnings of $1,284,949. New York-bred Espresso Shot is the 9-5 morning-line favorite after graduating from a victory over state-breds in the Dec. 29 East View Stakes to take the March 9 Busher Stakes in open company at a flat mile. PURE SILVER, multiple stakes winner including the G2-Adirondack S. was awarded CHAMPION 2 Yr-Old Filly NY Bred of 2017. 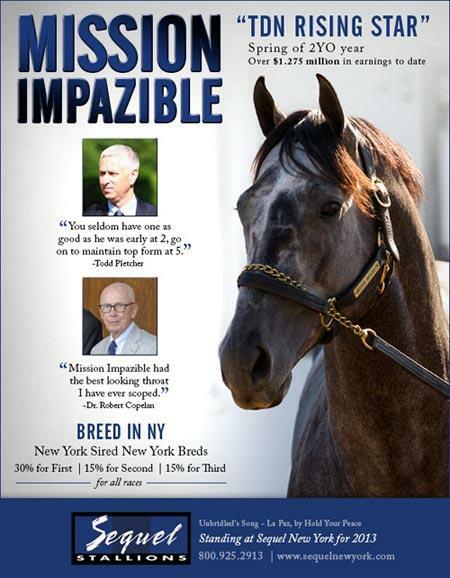 Bred and raced by Twin Creeks and sired by Twin Creek's very own MISSION IMPAZIBLE. "We have hand selected an outstanding group of mares at Twin Creeks Farm to breed to Mission Impazible in hopes of giving him the best possible chance of becoming a leading sire in New York."